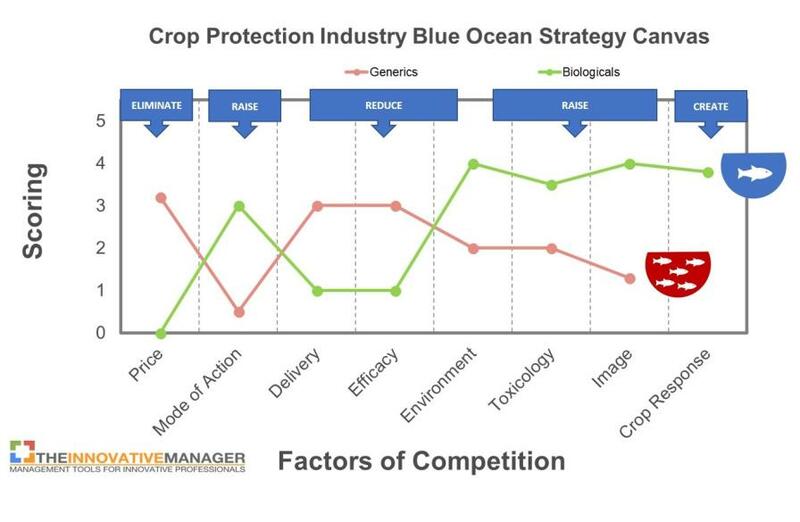 n the previous article in this series on Strategic R&D Management in AgChem and BioScience, we learned how the biopesticide industry creates a “Blue Ocean” of uncontested crop protection market space. In Part II, we will learn how the SMART-TECH Industry builds on the biopesticide industry’s value proposition to create a new “Blue Ocean” in crop protection. The biologicals industry is coming of age (see my recent articles in this series), driving the development of sustainable, biology-based crop protection products. One of the key take-home messages in these articles is that significant strategic synergies can be anticipated by integrating biological and conventional crop protection — not only between products but also between the knowledge bases for these strategies. The traditional approach to generic crop protection product development has been to compete on prices and incrementally improve formulation and delivery technologies. This strategic profile is unlikely to create market-shaping innovations. Accordingly, the nascent biopesticide industry staked out new utility propositions, to generate a unique strategic profile. Figure 1: Strategy Canvas, Biopesticide industry compared to the generic crop protection industry. “Blue Ocean” Value Innovation opportunities and strategic adaptations facilitate the identification and development of “Pioneer” products (adapted from Kim & Mauborgne, authors/creators of Blue Ocean Strategy). While the generic product development strategy has been to incrementally improve formulation and delivery technologies, significant increases in our understanding of inducible plant defense responses (strongly driven by decades of biologicals R&D) provide us with a new and powerful tool to increase product efficacy. This may be achieved through the integration of plant defense responses into overall crop protection strategies — an alliance between farmer and crop. Inducible plant defense responses have developed over more than 100 million years and have consistently and effectively ensured species’ survival. For integrated product:crop strategies in monocultures, however, the kinetics of plant defense induction require precise and timely activation — after confirmation of pest or disease presence, but before disease or pest pressures exceed a specific threshold. A critical success factor for the above is the understanding — and the timely induction — of plant defense kinetics. Fortunately, scouting and threshold monitoring through drone-based technologies are now available to provide the real-time information to make inducible plant defense responses a feasible option for the development of a new generation of integrated crop:product strategies. The SMART-TECH industry connects with Biological Advances to increase “Blue Ocean” Value Innovation opportunities. In response to this new generation of integrated crop:product strategies, the SMART-TECH industry has staked out new utility propositions on the Grower Utility map by building on the biopesticide industry’s value proposition, to generate a unique strategic profile. Figure 2: Grower Utility Map. The SMART-TECH industry has created a “Blue Ocean” of “Pioneer” products. These are products providing value innovations, such as the integration of technical advancements or novel technologies) and strategies, through advances in agricultural, satellite, and drone technology and by building on the biopesticide industry’s value proposition, to generate a unique strategic profile (adapted from Kim & Mauborgne, authors/creators of Blue Ocean Strategy). A fundamental R&D and marketing objective for most conventional crop protection organizations has been to improve the efficacy of existing products and thereby reduce the amount of active ingredient required to achieve optimal crop protection. However, for true sustainability, it’s no longer enough to look BACKWARDS and increase efficacy and reduce rates in response to regulatory and public pressure. In the SMART REVOLUTION, real-time scouting and information technologies will allow the timely inclusion of inducible plant defense responses for crop protection solutions. This will drive rate and volume reduction as FORWARD strategies, such as targeted drone delivery, removing one of the significant technical hurdles to making this leap forward toward truly sustainable crop protection. 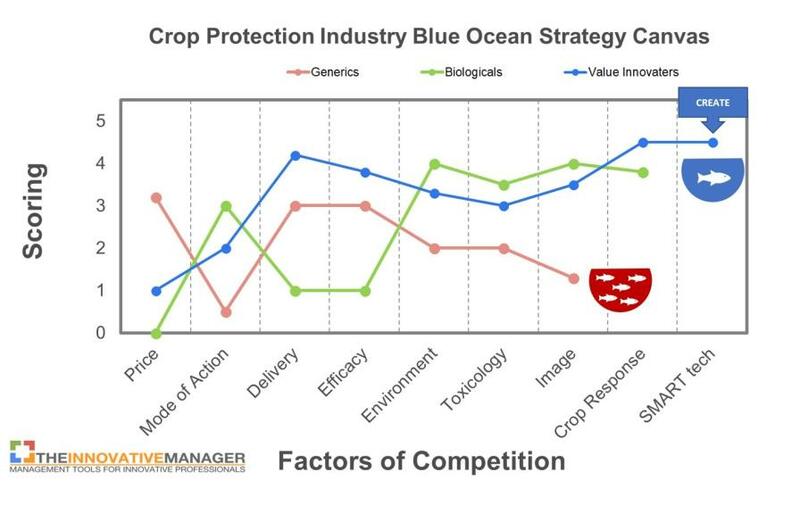 Figure 3: Strategy Canvas, the SMART-TECH and biopesticide industries compared to the generic crop protection industry. “Blue Ocean” Value Innovation opportunities and strategic adaptations facilitate the identification and development of “Pioneer” products (adapted from Kim & Mauborgne, authors/creators of Blue Ocean Strategy). 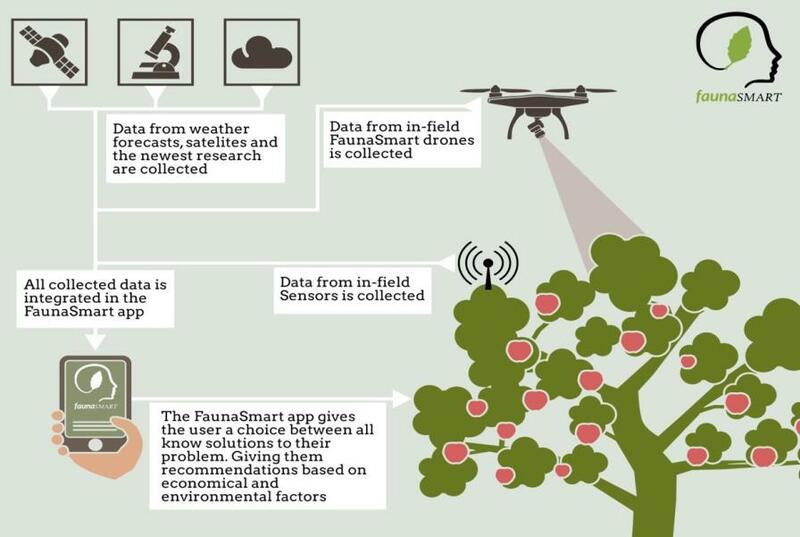 The Danish startup FaunaSmart is an example of a new company contributing to the SMART REVOLUTION and is the first precision agriculture company where precision is also based on DNA, providing opportunities for sustainable, Integrated Pest Management through the use of drones for monitoring, field sampling, and real-time DNA identification of insect colonies in their early developmental stages. Figure 4: Danish startup FaunaSmart contributes to the SMART REVOLUTION by introducing novel Value Innovation opportunities and strategic adaptations. In the FaunaSmart system drones are used as tools for real-time field inspection of pest species present. These drones offer accuracy and efficiency, analyzing fields with cameras or need-be DNA samplers. FaunaSmart software analyses pest risk levels, provides real-time, in-field maps and when it displays different zones, the software finds the most efficient and environmentally friendly solutions to control pests. Together with formulation and delivery advances, real-time drone scouting and analysis will drive improved product efficacy — permitting significant reductions in product volume. This, in turn, will finally allow the development of targeted drone-based application technologies, for which a major technical impedance has been the requirement for low spray volumes. A new generation of integrated crop:product strategies coupled with real-time scouting, monitoring, and data evaluation as well as targeted drone-based application technologies can provide significant and sustainable opportunities for differentiation in the highly competitive crop protection market. Often, innovations need to overcome resistance from stakeholders within the company. Key organizational hurdles include cognitive, resource, motivational, and political hurdles that prevent strategy executors from committing to the strategic shift, providing resources, leading innovation teams, and from overcoming external opposition. To learn more about building execution into strategy, check out the previous articles in my Strategic R&D Management series. 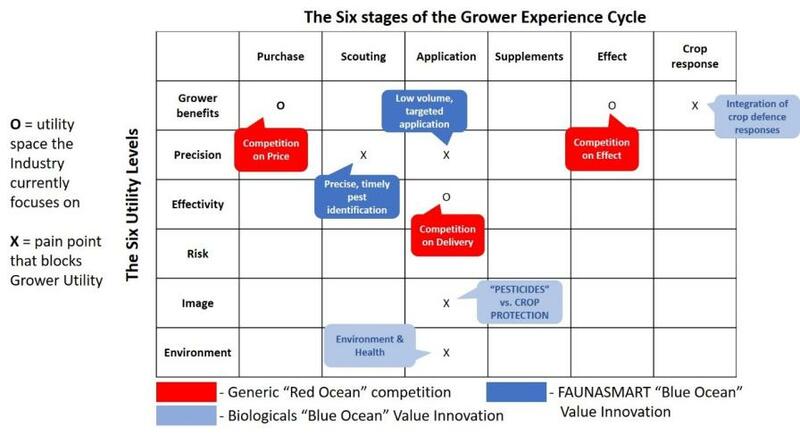 In the next article of this series, we continue with Part II of how the Biopesticide & SMART-TECH Industries create a “Blue Ocean” of uncontested crop protection market space.